Apple has revamped several forms and tools on its site that developers or content producers can use to submit copyright claims for their apps or content. 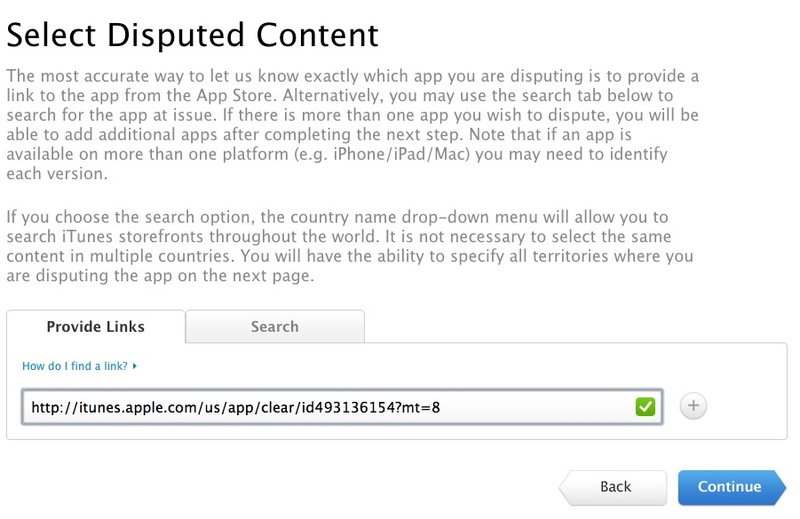 The form to submit disputes based on apps is a brand new one, as pointed out by iOS developer Brad Larson on Twitter. We’re not exactly sure when the changes were made, but we’ve spoken to other developers who have used them recently and they’re definitely updated. The biggest new form is probably the iTunes Content Dispute tool that is now set up especially for claims related to apps. You may recall that we brought you news that Apple was likely cracking down on cloning of popular app icons yesterday. It seems like they’re also trying to make it easier for any claim of infringement by copycat apps to be submitted by developers. If you believe that an application available in the App Store violates your intellectual property rights, you can use this form to submit a claim to the App Store Legal Team. Apps on the App Store are made available by third party providers. Once you have identified the app and described the alleged infringement on the following pages, we will respond via email with a reference number and will put you in direct contact with the provider of the disputed app. Any further contact with the App Store Legal team should be made via email and should include the reference number in the subject line. From that point, developers are required to enter contact information. Apple then contacts both parties so that they can work together to resolve the dispute. Apple has also apparently updated the standard iTunes copyright infringement electronic submission process, which now provides much more clarity and detail. This is the tool that it provides for all other types of content that aren’t apps, like movies and music. As the App Store has gotten bigger, a recurring theme has been that popular apps get cloned in one fashion or another. Sometimes only their icons are cloned, and other times whole swaths of content are copied. Apple is clearly looking to minimize these occurrences as much as possible or, in the event that they do happen, to resolve them quickly.